Japanese Episode DP 035: "Goyou of the Four Heavenly Kings and Doutakun"
American Episode 499: "An Elite Meet And Greet!" Hikari has just captured a Buoysel, so she introduces it to everyone. The pokemon doesn't seem to want to get to know its new traveling companions, so Satoshi offers to have a battle with it to loosen it up a bit. Even though Buoysel refuses to listen to any of Hikari's orders, the pokemon is able to defeat Satoshi's Naetle. As Hikari wonders what to do with her disobedient pokemon, our heroes take Satoshi's injured Naetle to the Pokemon Center. There, they have a surprise meeting with none other than Goyou, one of the Four Heavenly Kings of Shin'ou! 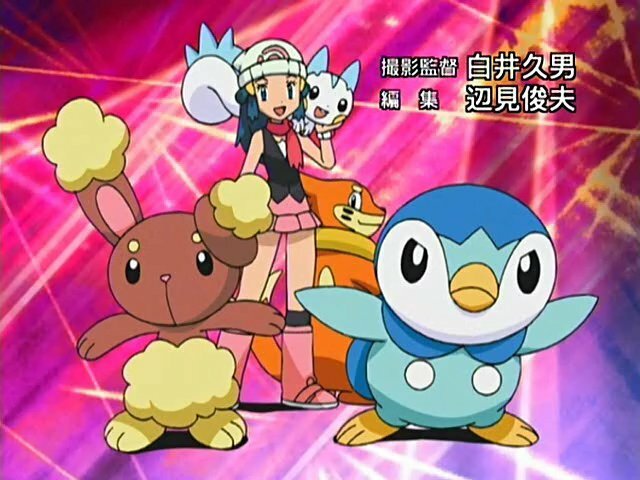 After explaining the flow of the champion challenge, the elite trainer notices Buoysel's strong fighting spirit and decides to battle the pokemon. Goyou chooses Doutakun to battle Buoysel. Just like before, Buoysel refuses to listen to any of Hikari's commands. However, unlike the previous battle, Buoysel loses without even landing a single attack! After the battle, Buoysel falls into a slump that it's unable to break out of until it escapes from a trap the Rocket-Dan had set for it. Once the trio of thieves are taken care of, Buoysel regains its fighting spirit and requests another battle with Goyou. 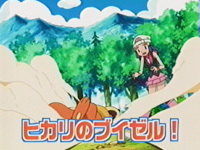 This time, the water-type pokemon listens to Hikari's commands and is actually able to land a few attacks! Goyou recalls his Doutakun before a winner can be decided and tells Hikari that she's growing a lot as a trainer. The Four Heavenly Kings member leaves our heroes to attend to some other business and tells Satoshi that he'll be waiting for him in the championship league. It's kind of funny that after ten years, the anime is only just now explaining the whole Four Heavenly Emperors thing. I mean, after three game-based leagues and two filler leagues, you'd think that someone would have brought it up by now, wouldn't you? Hopefully, Goyou's explanation of how the championship league plays out and we actually get to see Satoshi fight the elite trainers one after another the way you do in the games. It's still early in Diamond & Pearl, so we'll see. Other than the Four Heavenly Kings stuff, the episode didn't have that much going for it. Buoysel was a little more interesting than it was in the last episode, but I found myself not caring when it started sulking halfway into the episode. I was amused by the Rocket-Dan's inability to think of a use for Doutakun, though. The dubbed version is pretty standard except for a weird scene shift early in the episode. Lucian's voice isn't bad, but it isn't that great, either. 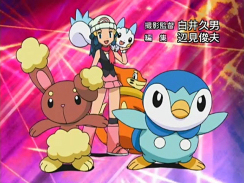 In Japan, both the opening and the ending animations are updated to include Buoysel in the group. I'll only post a shot of the opening changes since there are way too many changes in the ending theme to post here. As always, click on each image to view a larger version. None of these shots are in the American version of the opening, but even if they were, they probably wouldn't be updated. 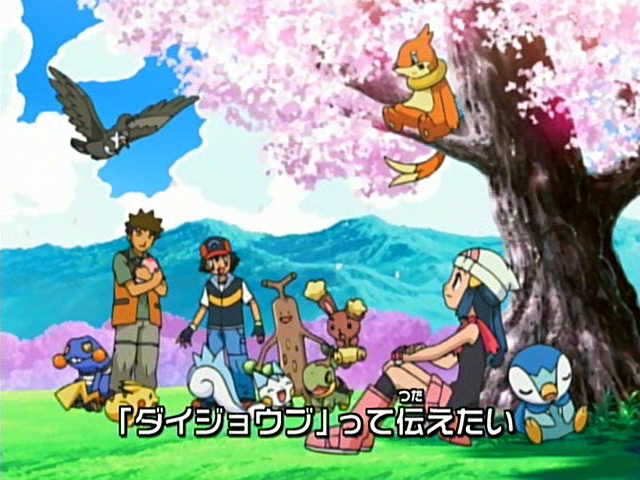 In the Japanese version, the cold opening shows scenes from later in the episode. We're used to that by now, right? We see the opening theme, we see the scenes where Hikari introduces everyone to Buoysel, and then we get the episode's title screen. 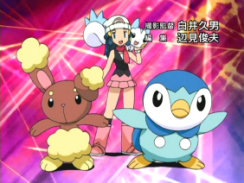 In the dub, however, the part where Dawn introduces everyone to Buizel is moved to before the theme song. That way, we go straight to the title screen after the opening theme instead of having to wait. It's an utterly bizarre change that really doesn't accomplish everything. I mean, Pokémon USA has had episodes where there's a cold opening and a little bit of episode before the title screen and left those alone. So why are they tampering around with things now? In the dub, Team Rocket talks about how they put a mortgage on their balloon to pay for the cage that captures Buoysel. This isn't in the Japanese version at all. I mean, can you imagine the Rocket-Dan being able to go into a bank and getting a loan approved? Me neither. After Buoysel decides to obey Hikari at the end of the episode, Pokémon Symphonic Medley starts to play in the Japanese version. This is replaced in the dub with instrumental music. Three seconds are added to the episode's TO BE CONTINUED... screen.